Bf 109 E-7 TROP MESSERCHMITT. 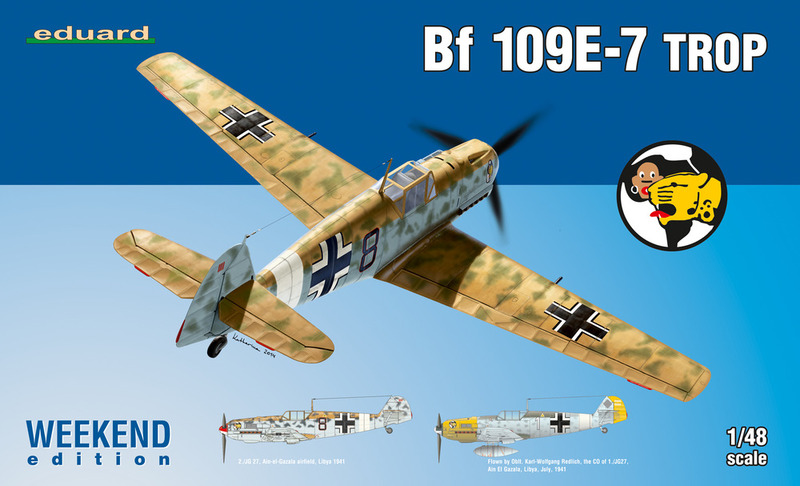 WEEK END EDITION HIGHLY DETAIL PLASTIC MODEL KIT + EDUARD SUPER FABRIC SEAT BELT + TWO COMPLETE DECAL AIRPLANE + SPENCILS. THE QUALITY AND PRECISION OF THIS MODEL SURPASSES ALL PREDECESSORS BRANDS. HIGHLY DETAIL SURFACE WITH ENGRAVED PANEL LINES. DETAIL COCKPIT WITH FLOOR AND SIDE WALLS, ENGRABED INSTRUMENT AND LATERAL PANELS, SEAT BELT, CONTROL STICK, PEDALS, GUN SIGHT. COMPLETE ENGINE, MOVABLE PROPELLER, OPEN OR CLOSED COWLING & NOSE GUNS. EXHAUST, AIR INTAKE & SAND FILTER. SEPARATED WING AND TAIL CONTROL SURFACES, RADIATOR FLAPSDETAILED WHEELS AND WHEEL BAY, AUXILIAR FUEL TANK. OPEN OR CLOSE COPCKIT. MARKS: 1. 2./JG 27, Ain En Gazala airfield, Libya 1941 Flown by Oblt. Karl-Wolfgang Redlich. ; 2. the CO of 1./JG27, Ain El Gazala, Libya, July, 1941 LA CALIDAD Y PRESICION DE ESTE MODELO SOBREPASA A TODOS SUS PREDECESORES, INCLUYE CALCAS FIELES A LAS ORIGINALES. CONTIENE CABINA CON PANEL DE INSTRUMENTOS Y PANELES LATERALES. MOTOR COMPLETO Y AMETRALLADORAS DE NARIZ ABIERTAS O CERRADAS. SUPERFICIES DE CONTROL SEPARADAS EN ALAS Y TIMON, TREN DE ATERRIZAJE Y BAHIAS DE RUEDAS DETALLADAS. TANQUE AUXILIAR. CABINA ABIERTA O CERRADA, LINEAS DE PANEL GRABADAS. 2 DECORACIONES.